WE MAY BE REPEATING WARNING INFORMATION MANY TIMES, HOWEVER IT IS FOR THE CONSUMER'S OWN GOOD TO BE EDUCATED ABOUT THE PRODUCT THEY ARE PURCHASING IN ORDER TO ENJOY IT. ALSO RETURNS ARE NOT ACCEPTED UNLESS PROOF OF PACKAGE DETERIORATED RESULTING WITH BROKEN PRODUCT DURING SHIPMENT/TRANSIT AND/OR PROOF OF FACTORY DEFECTIVE PRODUCT. anywhere Fireplace ® ™ Combustibles - Fuels: Bio-Ethanol Liquid Or Gel Fuels. FuelBio-Ethanol Liquid Or Gel Fuels for Ventless Fireplaces. Each fireplace has a specific fuel it must use. Never use any other kind of fuel as a substitute other than the fireplaces proper intended fuel. BE SURE TO READ ALL THE SAFETY WARNINGS BELOW! IF YOU HAVE ANY QUESTIONS AFTER READING THESE SAFETY WARNINGS, DON’T HESITATE TO CONTACT: [email protected] or 914-834-5855. The appropriate fuel for each Anywhere Fireplace model differs. Some use liquid fuel made specifically for ventless fireplaces, others use gel fuel cans and the torches use citronella fuel. They cannot be interchanged and it is important to follow the chart below to know the correct type of fuel to use. We have done the research for you and we have found the safest, and most economical fuel for your use in ethanol fireplaces. We recommend you use the brands we have available on our website for sale, however if you choose to purchase another brand, it MUST be made for ventless bio-ethanol fireplaces and you MUST be sure to read all instructions and warnings on any fuel you decide to use as well as the fireplace instructions and warnings. Make sure when purchase fuel you see the chart above to purchase the correct kinds of fuel. For the Empire and Oasis indoor/outdoor fireplaces, only gel fuel cans maybe used. These Gel Fuel will only work for the Anywhere Fireplace Empire and Oasis models. All other Anywhere Fireplace models need to use Liquid Bio-Ethanol Fuel. The Gel Fuel burns into vapor water, free of smoke, fumes, sparks and flying embers. The real flame will create approximately a 7inch flame with all the crackling sounds of real wood burning in just minutes of lighting while giving off a good amount of heat. Each canister will last approx 2-2.5 hours. Before purchasing, be sure to read your fireplace instructions for safety and usage. Please note: This fuel cannot be shipped by air and only within the 48 contiguous states. The Anywhere Garden Torches use citronella oil and will keep you bug free. Citronella oil is readily available in major retailers or your local hardware store. SMARTFUEL™ features flame arrestor in the neck of the bottle to provide additional safety against possible flash-fire when transferring fuel from the bottle into the fireplace reservoir. SMARTFUEL™ is Laboratory Tested and Certified for both it’s SAFETY POUR™ technology, and it’s clean, toxic free exhaust for indoor burning… providing consumer ‘peace of mind’. Laboratory Certification & MSDS are available online. 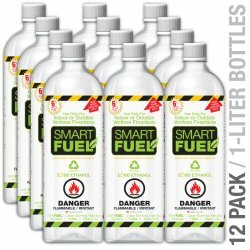 SMARTFUEL™: YOUR SAFETY IS OUR FIRST CONCERN. Never pour fuel into a lit fire or into a burner that is near a source of ignition. Never pour fuel onto hot surfaces. Allow burners to cool at least 15-20 minutes (cool to the touch) before refilling. Store SMARTFUEL™ in a cool place, away from direct sunlight or heat source. Never let children handle fuel or operate fireplace or burner. Always read & follow manufacturers operating and safety instructions prior to use in addition to all instructions and warnings that accompanied your fireplace. We do our best to ensure your safety by delivering our fuel in the safest possible package while providing as much safety information as possible; on the label and on our website. But in the end, it is You, the User, that must use this dangerous fuel in a safe and responsible manner. Be very cautious and use common sense. Failure to follow safety instructions may lead to serious injury or death. While the flame provided by burning the fuel is highly decorative and beautiful, it also is efficient in providing heat however it cannot be recommended or considered as a main heat source. After filling your fireplace, be sure to replace bottle top and remove bottle from area of the fireplace before lighting the fireplace. D0 NOT touch while burning or immediately after burning. CLEAN UP ANY FUEL THAT MAY HAVE SPILLED and make sure any surface moisture from spillage is gone or has evaporated before lighting. Only use an extended lighter or long match to ignite. Never attempt to ignite with any other device. 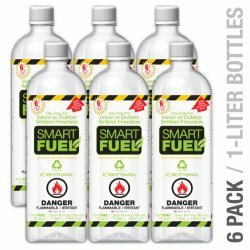 LIQUID BIO-ETHANOL FUEL (Smart Fuel brand) 1 litre bottles, made specifically for ventless fireplaces. 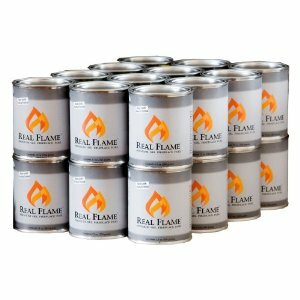 GEL FUEL (Crackling Flame or Real Flame brands) 13 oz cans, made specifically for the smaller tabletop fireplaces. 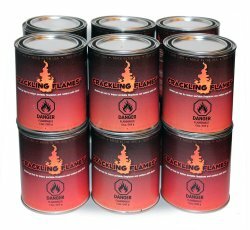 • Made from recycled prodcuts, 'Greenest Choice EthanolTM"
Crackle Flame is created to be used in Gel Fuel Ventless Fireplaces that use a 13 oz can. This Gel Fuel will only work for the Anywhere Fireplace Empire and Oasis models. All other Anywhere Fireplace models need to us Liquid Bio-Ethanol Fuel. Crackle FlameTM burns into water vapor, free of smoke, fumes, sparks and flying embers. You will appreciate the convenience of Crackle FlameTM Fuel for bringing a touch of warmth and comfort into your living area, both indoor and outdoor. The real flames will create approximately a 7" flame with all the crackling sounds of real wood burning in just minutes of lighting while giving of a good amount of heat. Each can will last approx 2-2.5 hours. BEFORE PURCHASING, BE SURE TO READ YOUR FIREPLACE INSTRUCTIONS FOR SAFETY AND USAGE. PLEASE NOTE: THIS FUEL CANNOT BE SHIPPED AIR DUE TO SHIPPING RESTRICTIONS OF THIS FLAMMABLE PRODUCT. CAN ONLY BE SHIPPED WITHIN THE CONTIGUOUS STATES.